Yesterday was the vernal equinox – the day with equal hours of light and darkness that marks the coming of spring. “Equal” being an approximate term, of course, depending on your latitude. At this time last year, my particular latitude was covered in several feet of snow… snow that lasted so long, a friend who came out to visit in April spent a good chunk of her time tromping around on snowshoes while I wrote How Can We Reduce Agricultural Pollution. The lake has melted (several times). There are ducks swimming in it. Mallards, so far, but I’m hoping the Harlequin ducks that nested here last year will come back, too! The deer that have been hiding in the woods during the colder weather are once more making their daily rounds through my backyard. My cats are fighting over sun puddles – a rare commodity in the Nova Scotian winter! 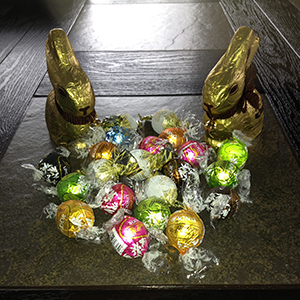 Easter candy – also a sure sign of spring! Want more? Check out this fun article on odd ways to celebrate the spring equinox, and this one on why this year’s equinox is the earliest since 1896. Spoiler alert – it’s because of Leap Year (the 29th, not the adorable movie). What about you? Any signs of spring where you live?